2018 VOTE Democratic November 6th! 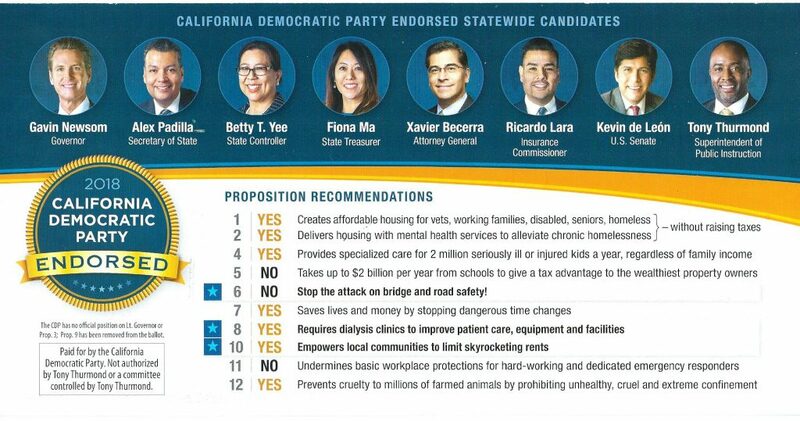 This year’s Proposition 4 is the smallest bond measure on the November ballot, but it is no less crucial for that. The $1.5 billion would go to improving the capacity, safety and equipment in a select number of crucial children’s hospitals across California. In both 2004 and 2008, voters approved similar measures for other hospitals and now the time has come out to add our own region’s Valley Children’s Hospital to the list. These hospitals need this extra bit of money now because a growing percentage of their patients are on MediCal and the state reimburses hospitals for those services at one of the lowest rates in the country. At the same time, the deadline to renovate for new safety standards still looms in 2030 and the hospitals need this extra push to insure they can get it done. While a long-term solution would need to be an increase in MediCal payouts, this Proposition ensures that while the details of such a complicated overhaul are being worked out the children of the Central Valley, and the rest of the state, don’t suffer. 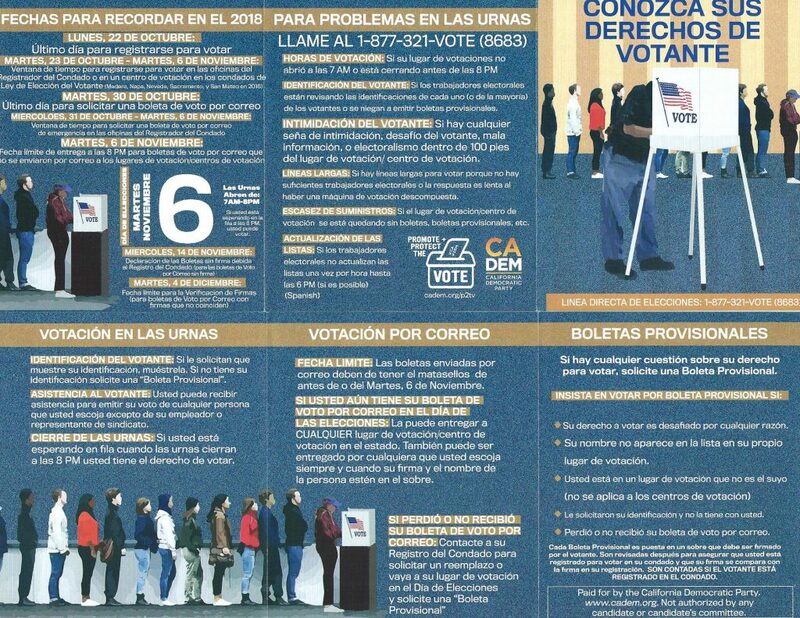 The California Democratic Party is launching the 2018 Promote and Protect the Vote (P2TV) Program to help ensure that elections are well and fairly managed. This will work to assist voters with voting-related questions as well as investigate and troubleshoot election-related issues with our network of volunteer attorneys and election officials. The program will provide voter protection resources and training to Democratic campaigns, County Central Committees, clubs/organizations and activists, and allied/partnered organizations. Tuesday, Oct. 9, to Friday, Nov. 2—weekdays 9 a.m.–6 p.m.
Saturday, Nov. 3, through Monday, Nov. 5—9 a.m.–6 p.m.
Tuesday, Nov. 6 (Election Day)—6:30 a.m.–8 p.m. There are also information resources to help educate and prepare for this upcoming election. The P2TV Primer on Voting and Election includes a general overview and key points on voting and election for this election cycle. Click here to download the Primer. In-language voting rights and FAQ palm cards will be available in mid-October. 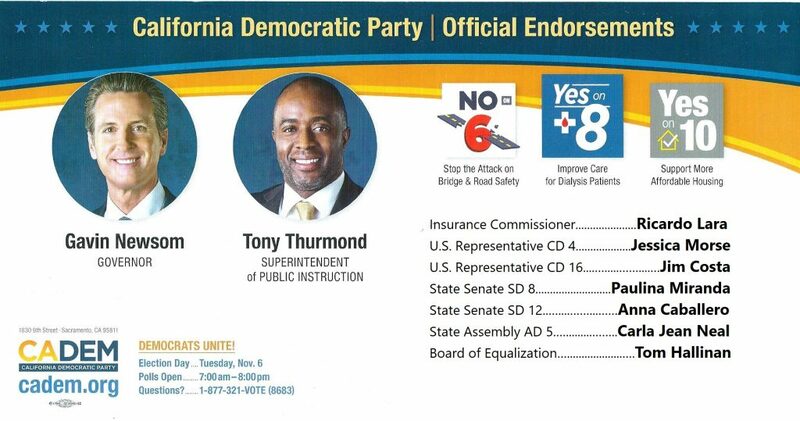 Later this month, the party will also host a P2TV Voter Protection Webinar. Click here to sign up and join our Voter Protection webinar. The webinar will include key information on voting and elections to protect the vote. 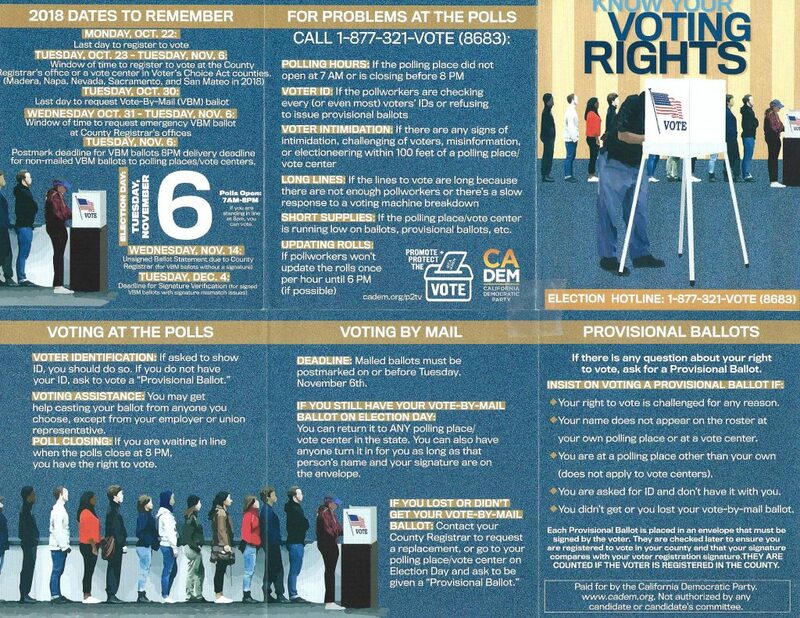 Please visit our Promote and Protect the Vote webpage for all these and more resources: www.cadem.org/p2tv. 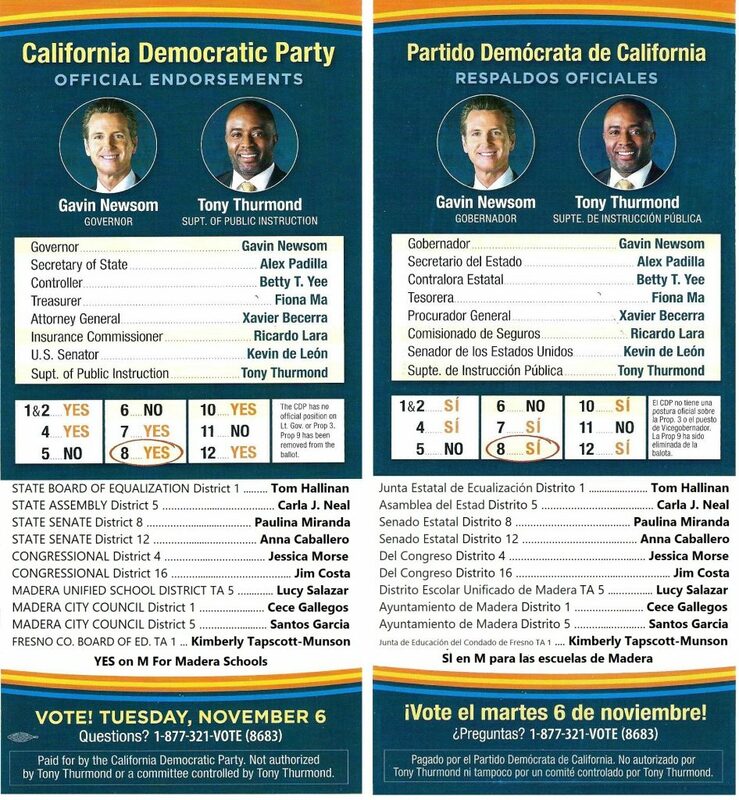 CA Blue WAVE: Grab ‘Em by the Midterms! For details about our recommendations on the Tuesday, November 6, 2018 General Election Ballot, Go HERE.